Graham Phillips searches for an ancient cup said to have been used by Mary Magdalene to collect the blood of the crucified Christ. The original Holy Grail. The popular Arthurian stories of the Middle Ages depict the Holy Grail as the cup of the Last Supper, used by the disciples to contain drops of Christ’s blood collected after the Crucifixion. Secretly brought to Britain, it was hidden in a chapel where it was later sought by King Arthur and his knights. It is said that the Grail has miraculous healing powers and can give eternal life to whoever drinks from it. 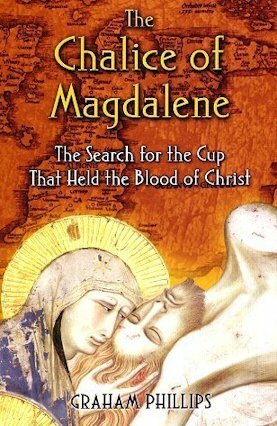 There was, though, another legend suggesting the Grail was originally thought to have been a sacred vessel that once belonged to Jesus' follower Mary Magdalene. Up until the ninteenth century, this Grail was belived to have been a genuine historical artifact still hidden somewhere in the heart of England. Read on - the search for this remarkable holy relic begins. English editions: USA: Bear & Company 2004. UK (published as The Search for the Grail): HB Century 1995, PB Arrow 1996. Translations: Foreign translations: Heyne (German), Sperling & Kupfer (Italian), Edhasa (Spanish), Tirion (Dutch).